I’ve had board games on the mind a lot lately; it might have been the new Cards Against Humanity expansion or it might be all the Table Top episodes I’ve been watching. Regardless I knew I needed to spend some time rolling dice. The biggest challenge is finding the time and finding additional players that also have the time to do play. There have been a few Kickstarters lately that I had to stop myself from funding because I knew I’d never get around to playing what looked like an awesome game. So I was lucky enough to find the time and some players to play some Risk. When delving into my closet I was surprised to find out I don’t actually own a version of vanilla Risk. 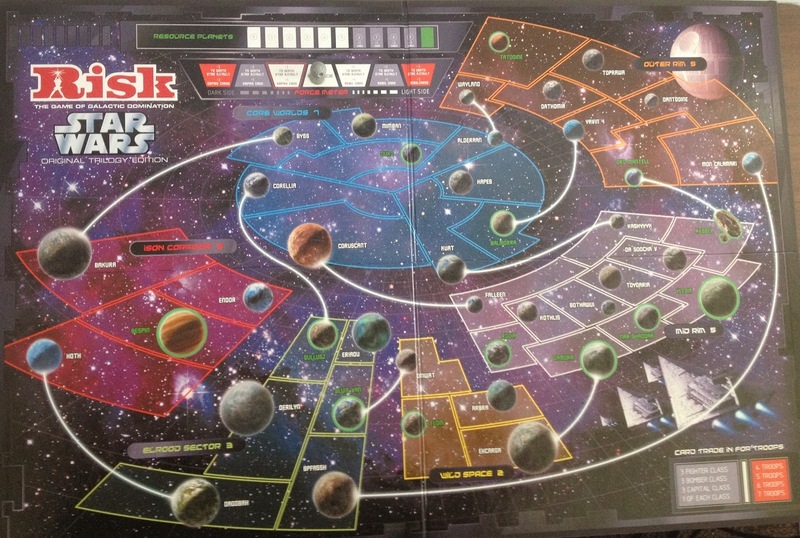 I have Godstorm and Star Wars Risk. Being that all the players are big Star Wars fans I went with that version. 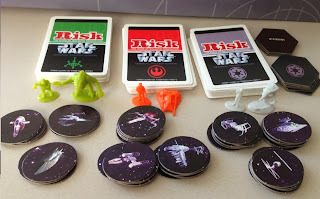 There are two different versions of Star Wars Risk; one for the Original Trilogy and one for Clone Wars. Star Wars Risk differs from standard Risk in a few ways. The first is the factions. Playersr will be controlling the Empire, the Rebellion, or the Hutts. Each of these groups has their own conditions for winning. The Empire needs to wipe out the Rebellion, the Hutts need to control certain planets on the map, and the Rebellion needs to kill the Emperor (or wipe out the Empire). 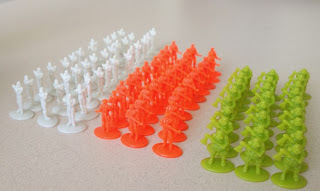 Each army also has a different number of planets they start the game with and a different number of troops. The Empire has the largest starting army and controls the most planets. It’s a thematic change but is mostly balanced out during gameplay. Those aren’t the only additions either. 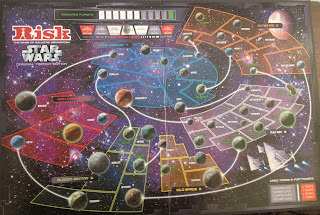 Depending on the cards played during the game, there is Force setting that affects how many cards the Empire and the Rebellion get and how easy/hard it is to destroy the Death Star. That’s right, I said the Death Star. The Death Star can actually destroy a planet and any armies on it. It isn’t easy to fire the Death Star but it’s quite effective when it does go off. There are also fighter, bomber, and capital class ship tokens. These ships help out dice rolls; either by adding to the number you rolled or by changing the dice type. Finally the Empire gets to place defensive bunkers. There bases make it easier to defend an area but one of them houses the Emperor. If the Rebels manage to kill the Emperor they’ve won the game. If you’re looking for your own copy I’m sorry to say it’s been out of print for a while now. The price on eBay seems to fluctuate pretty wildly on this one, so if you keep an eye on the auctions you may be able to score one at a reasonable price.